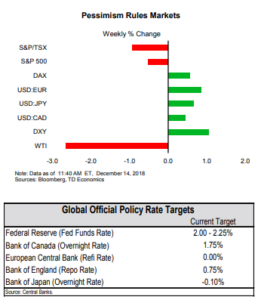 After some optimism early in the week, financial market sentiment soured as focus shifted back to fears of an escalation in trade tensions, Brexit uncertainty, and a potential economic downturn in 2019. The U.S. consumer remained unbowed in November, with consumer spending now tracking above 3% annualized in Q4. Inflation has cooled in line with oil prices, which should help to support real spending going forward. 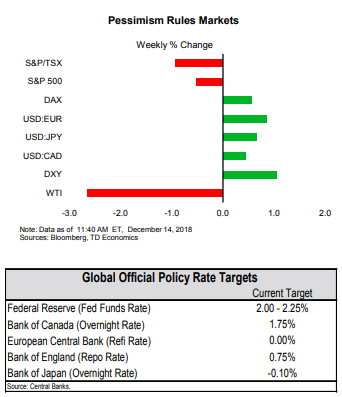 The FOMC makes its final decision of 2019 next week, and a hike is universally expected. We will be watching closely to see how members’ views have changed about how many hikes will ultimately be required in this cycle. 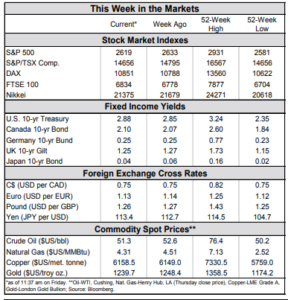 After some optimism early in the week, supported by positive headlines about the lessening of U.S.-China trade tensions, sentiment turned sour to end the week. Markets seem to be channeling Dickens’s curmudgeonly character Ebenezer Scrooge, saying “Bah! Humbug!” to any good news that comes along. 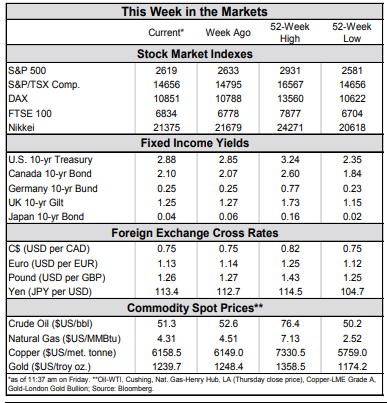 Markets are down roughly 10% in the fourth quarter of this year as investors fret about prospects for 2019, focusing on the potential for escalating trade tensions, uncertainty about the path of Brexit, and a potential economic downturn. 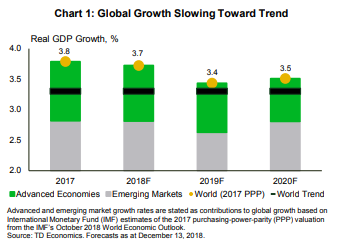 Our latest outlook did feature a small downgrade to global growth (Chart 1). However, the selloff in global risk assets in the fourth quarter has been outsized relative to the magnitude of the economic slowdown. The selloff likely reflects the build-up of unresolved global risks, coupled with a delayed adjustment in growth expectations from lofty levels. Taking a step back from the downturn in equity markets, there are few signs that the economic expansion is nearing an end, other than the fact that the expansion is approaching the longest on record. One worry is that negative sentiment can become self-fulfilling (see our Perspective). We remain vigilant in monitoring signals of an impending downturn, such as yield curves, business confidence, risk-assets, and labor market conditions. Financial market pessimism certainly hasn’t yet filtered down to the U.S. consumer. The holiday shopping season appears to have gotten off to a good start in November, as retail sales were up more than expected, on top of upward revisions to October. 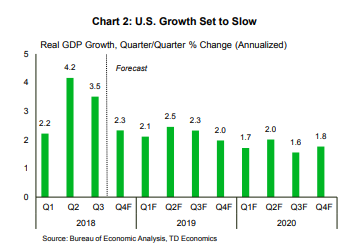 In our latest U.S. Outlook, we also expect the overall economy to moderate towards a sustainable pace in 2019 (Chart 2). 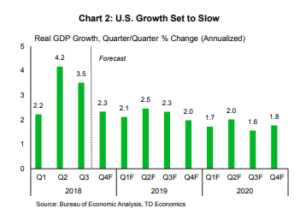 This process is already underway in the fourth quarter, where growth is tracking 2.3% after averaging 3.5% through the middle of the year. However, the consumer has more momentum. Today’s retail sales report places expectations for consumer spending in the fourth quarter to 3.5%, from our recently published 2.9%. The consumer is in pretty good shape. The job market is strong and inflation is contained. Economy-wide growth in wages and salaries has averaged roughly 4% over the past six months. And, headline inflation has cooled in line with lower oil prices. CPI inflation was at 2.2% year-on-year in November’s data. Our forecast is for inflation to remain around that level through 2019. That sets the consumer up for some decent real income gains. Therefore, we expect consumer spending to slow only modestly in 2019, as the windfall from tax cuts fades, but still running at a very healthy 2-2 ½% clip in real terms.